Muharram is a month which holds unique meaning for the world of Islam and Muslims due to the fact that it is first month of the Hijri (Lunar) year and its 10th day being the day of Ashura. 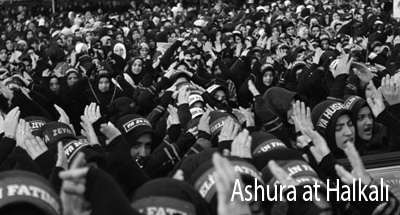 The day of Ashura had signified different meanings for different religions throughout history. However, it would come to be remembered as a day wherein a painful memory would become etched into the minds of Muslims. On the day of the 10th of Muharram, 61 years after the Hijra (migration) on the 10th of October in 680, the grandson of Prophet Muhammad, Hussain (pbuh) - the son of Ali (pbuh) and Fatima (pbuh) -- was murdered by Yazid and his army in Karbala. It was not only Hussain who was murdered during this massacre, but many Muslims who accompanied him, and those who remained alive were taken to Damascus, remaining in captivity for a while. This event, which played a key role in fermenting the deviation in the world of Islam, would come to be commemorated as a day of mourning in both the Sunni and Shiite Alevi worlds. The center for this custom, which continues in all its alacrity to this day, is naturally Karbala, the city where this unfortunate event took place. One of the cities in which Karbala and Hussein are remembered and traditions have been formed with regard to this day is Istanbul. Muslims schools of Tasawwuf have been among the Sunni groups to demonstrate the most amount of attention to this event. One of the traditions which continues to take place with regard to the day of Ashura is the annual events at the Kocamustafapasa Sumbul Sinan Sufi Lodge-Mosque. This tradition, which is a beautiful example of a ceremony recalling Karbala in the Sunni world, takes place on the 10thday of Muharram between dhuhr and asr prayers. 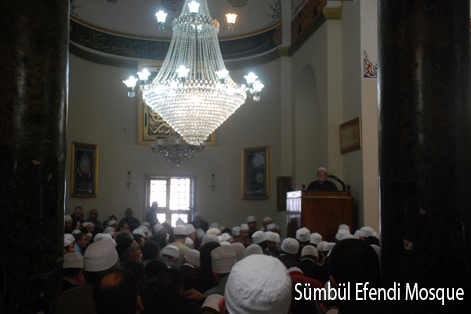 As such, this year on the 26th of December, 2009, believers convened at the Sümbül Efendi Mosque in the memory of the martyrs of Karbala. The first interesting aspect of the ceremony that takes place here is that it proceeds in a calm atmosphere in the mosque. Differing greatly from the Karbala commemoration ceremonies we are used to, which involve lamenting and torment, the congregation forms circles inside the mosque, raising their hands up for supplication for the martyrs of Karbala prior to the commencement of the actual ceremony. This humble ceremony continues with the "mersiye," (a mournful poem) a common practice in both Sunni and Shiite tradition, followed by a mawlid (singing praises to Prophet Muhammad and his family) whose every chapter is read by a different mawlid reciter. In between these chapters, nasheeds, recitation of the Qur'an and mersiye continue to be read. Following the mawlid hands are once again raised for supplication. Supplication is made for the hatm of Qur'an (Complete reading of the Qur'an) and the rewards of these hatm are wished upon the martyrs of Karbala. This practice which takes place at the Sümbül Efendi Mosque was also the central location for the commemorations on the day of Ashura during the Ottoman era. All of the tarikahs (religious groups) would convene here and the shaikh who was considered to have the most authority, would call on the dervishes for the remembrance of Allah, his Messenger and family as well as supplication. One of the ceremonies held in Istanbul is the annual mourning that takes place in Halkalı, which is organized by Turkey's Jafari congregration. In this ceremony, which sees large attendance, poetry is read while the memories of the Karbala events are revived through reenactments. 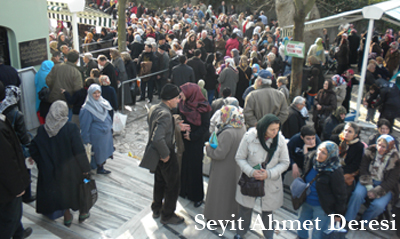 Another location which Istanbulites frequent on the day of Ashura is the Seyit Ahmet Deresi Persian Mosque adjacent to the Karacaahmet Cemetery. Unfortunately, it cannot be said that the spiritual and sensitive environment in the mosque is what carries over outside of the mosque as well. Despite the vendor traffic and "fair-like" atmosphere outside of the mosque, which contradicts the sensitivity required in commemorating Karbala, a unique spiritual atmosphere awaits believers inside the mosque.